Falcon Safaris was created with the vision of sharing the wonders of the African continent with those who are eager to explore some of the world’s most magnificent areas…areas that combine pristine, natural beauty, incredible wildlife, cultural diversity and remote, unspoiled and untamed wilderness. If you want to experience the true essence of Africa, then the big lodges filled with masses of tourists are not for you. We, in conjunction with only the very best of our local African partners, are here to offer you large, remote, private and exclusive concessions that cater to a minimal number of guests. With so few guests in such large unspoiled tracts of wilderness, the magical feeling is unlike anything you are likely to ever experience. Whether you want to plan the perfect honeymoon, the daring African adventure holiday, the ultimate African safari or a unique family vacation, Africa offers it all. Falcon Safaris are here to offer you photographic African safaris, eco tourism and adventure travel. All our trips are tailor-made to our guests’ specifications – so no two trips will ever be alike. Whatever your special interest, we have something that will meet your needs. We do all the research, plan your itinerary, provide necessary information and cover all details – all you need to do is pack your bag and prepare for the African vacation of a lifetime. Falcon Safaris is run by people who know the African continent intimately, who live there and who know the people and places. It is run by people who were born and raised in Africa and who continue to return year after year – not only to refresh their knowledge, but predominantly because of the love and passion that they have for its areas. 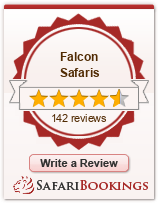 Falcon Safaris is owned and managed by Hamilton Mandi and Chenai. Our objective is to remain a highly personalised Tour Operator offering good ‘value for money’ Tours and personalised Itineraries driven by our love of Southern Africa.